← How can trams be made better? Do we want cars in the city centre? I’ve noted before that only 30% of commuters who work within the Hoddle Grid – i.e. the area bounded by Spring, Flinders, Spencer and La Trobe streets – drive to work. However only a block or two beyond the city rail loop, the share of work trips taken by car increases steeply to 50-60%, and above. Peter Parker at Melbourne on Transit offers an explanation. Using Metlink, he found a journey from Laverton station to Melbourne Town Hall in the morning peak takes 33 minutes. However if the Laverton traveller is bound for nearby Docklands (Waterfront City), the trip takes an extraordinary 54 minutes. Anyone travelling from Greensborough station to the same two destinations would have to allow an additional 29 minutes to get to Docklands and if travelling from Cheltenham station an extra 30 minutes. We have trams but unlike some compact European cities we don’t have a dense metro in the job-dense 2-5km core that allows for fast local travel. Instead for the ‘last mile’ we rely on slow surface modes, notably trams and buses, often without their own right of way. 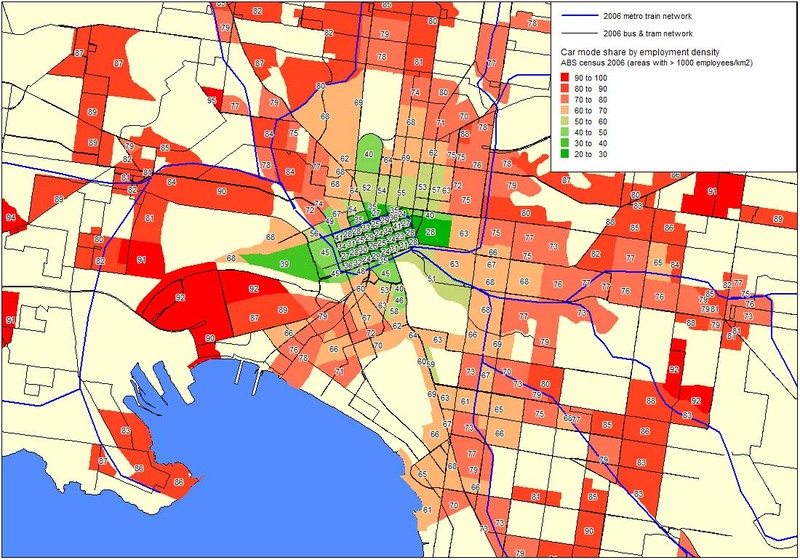 Public transport’s mode share in the vicinity of Waterfront City is just 22%. This is despite the area having a frequent tram service. Given the huge investment in public transport in the city centre, any mode share below 50% is very disappointing, but the figure for Waterfront City is appalling. I suspect there are two key reasons for the low mode share of near-CBD areas. The first is simply that the cost of driving and parking in these areas is still reasonably low – so workers drive because they can. Perhaps there’s a high proportion of workers in the CBD fringe whose status attracts a “company car”. Perhaps also there are more institutions like hospitals with shift workers who drive off-peak. The second reason is that movement within the city centre by public transport is too slow. That’s partly because the rail loop is not configured well for intra CBD trips and partly because trams are slowed by cars, particularly at intersections. The CBD is one of those places where I think it’s very hard to justify commuting by car, given the enormous investment in public transport infrastructure and the extremely high accessibility it provides to the rest of the metropolitan area. It’s such a vital asset to the city as a whole and to the State that its amenity should not be despoiled by the noise, fumes and danger of too many cars. The Melbourne City Council has proposed some worthwhile improvements, such as a maximum speed limit of 40 km/hr in the CBD (although I’d prefer 30 km/hr) and a plan to eliminate cars, taxis and vans from Swanston Street (although I fear the potential for pedestrian/cyclist conflict has not been fully resolved). These ideas are good but I think we need to go further. For starters, trams should have priority over cars at intersections. Some expansion of the tram network might ultimately be justified, but the first priority should be to ensure the existing system operates more efficiently. The number of cars also needs to be reduced. Consideration of some form of road pricing – perhaps a cordon system like that in London or along the lines of this one proposed for Melbourne by Harry Clarke and Andrew Hawkins in 2006 – is long overdue for the city centre. What ever form road pricing takes (I’ve talked about options and issues before, e.g. here and here), the key point is that drivers should be paying the full cost they impose on others, especially in terms of traffic congestion and the hit they make on city centre amenity. The price needs to be high enough to discourage both city centre commuters and the significant number of drivers who travel through the CBD for work and other purposes. The value of the city centre should not be underestimated. There is nothing else even remotely like it in the rest of the metropolitan area. It’s where tourists and business visitors spend much of their time and it hosts our highest order economic, social and cultural functions. Given that it’s so accessible by train, tram and bus, we should be planning to tame cars in the centre and give over street space to more civilised uses that reinforce the role and character of the centre. Whatever form it took, road pricing would necessarily require additional public transport capacity in the form of more frequent and reliable services (rather than new rail lines to the suburbs). It might possibly also require some significant expenditure to “buy off” through traffic – perhaps improvements to alternative routes. In the early years, it might be necessary politically to exclude through traffic on some roads like King and Spencer from the cordon. The city centre is a very precious resource so prima facie it’s worth spending a considerable amount to protect and enhance it. Needless to say, any proposals should be subject to rigorous and objective evaluation. I think that road pricing (not necessarily cordon tolling) could be used to raise funds to place some of the high frequency tram arteries underground, like a tram subway. The politics demands that the revenue be spent on something like better public transport. However as a source of revenue, road pricing won’t be in quite the same league as tolls, as it is based on marginal cost pricing rather than the average cost pricing favoured by private road operators i.e. its purpose is to ration demand for road space rather than raise revenue. Something elaborate like a tram subway might not be necessary if delays from cars can be eliminated. Melbourne City Council reckons 100 fewer trams would be needed if cars were brought to heel. I think the Swanston st tram artery is already running a tram a minute in peak hour. Placing the trams along this stretch underground would be a major improvement. No stopping for pedestrians or traffic lights either, and you can have a few platforms as well underground. Placing the trams underground would massively reduce their patronage and require buses on street level. Most tram passengers within the Hoddle Grid are short-distance riders who only get on the tram because there is always one coming, at every change of the lights. Put them underground and these people would walk. The MMTB proposed tram subways under Swanston and Bourke streets in the mid-1960s. Fortunately, these did not happen. A few cities in Europe have placed some of their trams in subways in some areas, but in almost all of the scores and scores of European cities with trams, they run on the surface as in Melbourne. This includes even such new systems as those in Athens, Paris, Strasbourg, Lyon, Manchester, Croydon and Sheffield. I should have mentioned San Francisco. In the early 1980s, trams from the suburbs were put underground along Market St, the main transit spine. In 1995, trams were reinstated on the surface along Market Street (the F line). Despite the suburban trams still running underground, the surface F line trams carry very large passenger loads. Curiously, they use “historic” trams such as the old PCCs (and even one or two Melbourne Ws), but the line nonetheless operates as an integral part of the city’s transit system. Placing trams into the highest level of priority- Class A right of way- will increase reliability and possibly capacity as well. A much better trip than battling mixed traffic in the city core. There would be nothing stopping Melbourne from leaving one or two routes to serve the surface streets and placing the rest underground either. Brisurban, as Poneke indicates, Swanston St has been a “problem” for more than 50 years. The main holdups on it are too many stops (which the mooted design changes will fix), stops that are too short to off-load several trams at once (likewise) and far too many lines given Swanston St is the only low-rise corridor in the CBD (see my comment below). Also, there is great reluctance to change trams at Domain (or spinelessness from the government to require it), meaning the change Poneke mentions below that ought to have resulted in trams stopping and turn around before the frequent spine, hardly achieved a thing. If every book I owned wasn’t in boxes right now I’d run through the options the 1969 transport plan gave for Swanston St. Maybe tomorrow night. One of them was under-grounding, but it came to nothing. A few places I’ve been to in Europe do have underground trams (Antwerp comes to mind), but the main cost of tunnelling is building stations and it is ill-suited to having stops every 400m. Running the trams underground wouldn’t be an improvement it would be a complete inconvenience. As for having trams operating less frequently (by having them terminate at Domain Interchange as proposed above) this also seems very illogical, given that most trams along Swanston Street are packed throughout the peaks and a lot of the day servicing RMIT and Melbourne Uni. 1) Trams are frequently stuck behind them, banking up other trams behind them. 2) While trams are stuck more and more passengers get on at key points (e.g. outside Melbourne Central and Flinders Street) meaning some trams end up packed to the rafters and others relatively empty. This slows loading and offloading for the packed trams, slowing all of them down. By spreading the load, all of them would run faster. Technology has existed and is used by many newer tram systems to trigger light sequences giving trams priority. True Swanston Street also crosses other tram routes which complicates things a bit, but given it has a far higher concentration of trams running along it, Swanston Street should get priority whenever possible. Julian, traffic light priority makes a difference, but it would be at the expense of cross-routes of which there are many. The trams on Elizabeth St. are considerably faster than Swanston St. largely because the trams are creating their own congestion. You point out the logic of using Domain transfers yourself. Most Swanston St trams are relatively empty from Flinders St to Swanston St. A select few are very full from Melbourne Central north, and Flinders St south, but only the front one. Having some trams terminate at Domain, allowing others to go faster, and carry the same number of passengers more efficiently makes sense – which is why it has been on the agenda for 50 years. Redirecting trams currently on Swanston St to the west-end of the city – which is under-serviced by transport from the south – would be better again. The William St tram goes up to Melbourne University anyway, so there would be no major disadvantage for passengers on those routes. If you have a tram coming every 1 minute or below that, and a traffic light takes 1 minute to change from red to green and back again, if you give priority to the tram always then that light is going to be permanently stuck on red for all other traffic. It would be like imagining having a level crossing just outside Flinders St. train station. The boom gate would be permanently down because the frequency of vehicles making the crossing is so high. In the last years before the introduction of modern trams (Z1 and on) on the Swanston Street routes, the traffic lights in Swanston Street operated on 80 s cycles. This gives 40 cycles per hour. Almost invariably this allowed 3 W class trams to cross every intersection on each green. The result was that close to 120 trams per hour travelled up, and then down, Swanston Street in the peak. Now, with the larger trams, fewer cross each intersection on each green, but as they are larger, the capacity of the service has been increased. You suggest placing trams underground would be a major improvement. This is doubtful. I think you will find that in almost every case where trams have been placed underground, someone, perhaps conscious of safety, has required a signalling system. This markedly reduces capacity, it would be almost impossible to allow two C or D class trams in the same underground station at the same time. Can be done on the surface, where there are ample indicators for the driver to assess distances and closing speeds, but in a subway these are nearly all gone. Hence safety first, and signalling is the rule. In Philadelphia, the signalling system in the tram subway has recently been ‘upgraded’ with the appalling result that capacity has been reduced, speeds reduced, and blockages have occurred. Both in Boston and San Francisco, in their tunnels, trams have been ‘rear-ended’, causing more delays. But trams in Swanston Street do not stop for pedestrians. The traffic lights at the ‘little’ streets should be removed, and traffic in those streets be LILOO (Left In, Left Out Only). This would enable trams to run as fast as possible to the stop at the next intersection. With traffic lights only on a completely rectilinear grid, the cycles could be optimised so that each tram would arrive at the next stop at the start of the red, alight and board passengers, and depart as soon as the green comes on. This would have the effect of ‘complete tram priority’ without the snags. In short, putting the trams underground would be a very expensive was of making the situation worse. If anything should go underground, it is the cars. Consider instead a car tunnel on King Street from south of Flinders Street to north of Dudley Street! I would just like to say this: I disagree. Trams placed in Class A right of way with their own dedicated alignment free of traffic lights and all traffic will have far better service characteristics than trams operating in Class B (own lane but share traffic light intersections with cars) and Class C right of ways (no priority whatsoever). That artery is well used, it is in the inner city and it makes a lot of sense. It’s true that trying to commute to areas just outside the CBD is oddly frustrating. I work in Carlton and if I had to commute by train, it would take me an hour, half of which would be spent on the Swanston St tram. It takes me between 35-45 minutes to drive and I have free parking (and I don’t need to drive through the CBD). It would take a lot to get me to give up my car in favour of the train and tram. At the moment, service is far too unreliable. Every morning I hear on the radio 15-20 minute delays on various lines. How can this be? First, trains need to run more often and on time to even get people to think about relying on the train when driving is an easy option (ie for those who work just outside the CBD). Doesn’t matter how quickly the tram runs if your train is delayed 20 minutes you’re still going to be late and not likely to take the train again. That’s the flaw in your proposal. People who work in the CBD may put up with occasional (or even frequent)delays because driving and parking in the CBD is prohibitive so over all it still works out better. But where driving is easy and parking is free, driver’s are not likely to give up the car for the train until services improve considerably. No, Brisurban. We should elevate them and place them on a single track, we could call them a monorail. I am not sure why we would raise funds for either of those proposals. Maybe we could use the revenue to fund hospitals and rescuing kittens. Re trams within the CBD vs Docklands, I dont see that trams are slowed by cars, what with cars mostly in separate lanes and hook turns (which should be introduced right accross inner city). If they are slow, its because there’s so many people getting on and off, its very crowded now, especially at peak hr. Also tram services to Docklands are not nearly as frequent as rest of CBD – Victoria Harbour served by only 1 full time Collins Street route, and a peak hr shuttle, as opposed to rest of Collins Street having three routes plus the shuttle. Waterfront City has two full time lines, and one peak hr shuttle, actually better served than the growing office precinct of Vic Harbour. So I think more trams more often would be the best way forward for Docklands. More separation of cars from trams in inner city (clearways, one way streets, hook turns) would also be useful. Melbourne City Council says traffic congestion, cars turning right across trams and limited priority for trams at some intersections are key issues slowing trams (Council also says there are too many stops). I believe those issues apply mainly to lines and stops outside the CBD grid; hook turns mean cars in the CBD turning right do not hold up trams, and car traffic rarely runs over the tram tracks. I’d add two things. Firstly, the major employment areas around the CBD (Domain/Southbank/Docklands) are all new, were built on top of major arterials or freeways and with substantial parking, so the major disincentive to driving that workers in the CBD have (no, or expensive parking, highly congested streets) aren’t really there. The further downsides of this we’ve mentioned before: indifferent walk-ability, lots of land taken up by parking reducing liveliness. 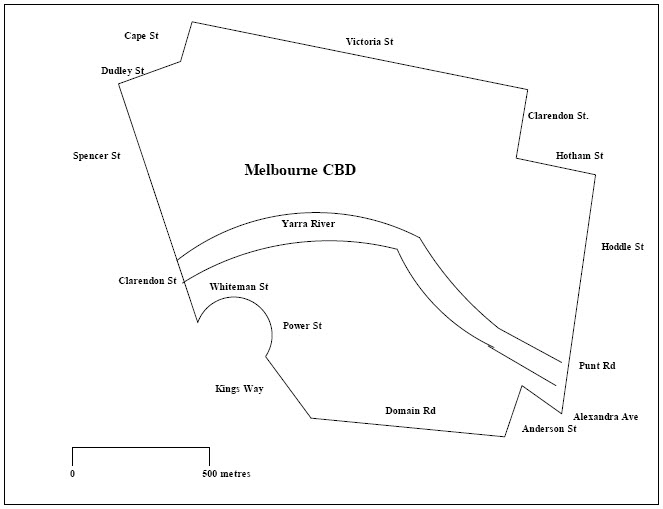 It is worth debating whether narrowing those major roads to make those areas more CBD-like would be worthwhile. Secondly, there has been no attempt to reorganise the trams (or most other forms of transport) to actually make any infill development more accessible. A few trams have been extended, but the bulk of trams still chug up Swanston St, when they could be distributed from St Kilda and Domain to use the 96 and 57 lines into the Flagstaff end/Docklands. Areas with much higher concentrations of employment. A few trams have been extended, but the bulk of trams still chug up Swanston St, when they could be distributed from St Kilda and Domain to use the 96 and 57 lines into the Flagstaff end/Docklands. Actually until about 1991, almost all the St Kilda Rd tram routes had services that were diverted into Kings Way and William St (the 57). These were axed with the creation of Domain Interchange. Passengers from the St Kilda Rd lines (the ones that chug up Swanston St) now have to change trams at Domain Interchange. The 57 carries a fair number of passengers for most of the day between Domain Interchange and the CBD, so the demand is clearly there. When the Kings Way line was laid after WWII, West Coburg trams (the 57) were throughrouted to St Kilda Beach via St Kilda Rd. Do we want cars in the city centre? An interesting and challenging question that needs to be quantified in terms of how many vehicles can the city centre handle at an acceptable level of service (LoS) while moving around? 1)	Car parks do not provide for through traffic, if one wants to go to the other side of a large car park, it will be necessary to drive round it. 3)	Well managed car parks prevent an imbalance and prevent excess cars entering. 4)	Maybe it is time to consider the number of vehicles that are safely and conveniently sustainable in our rather large central city “parking” area or parts of it, albeit even if some vehicles are on their way to a parking bay, drop off point or pick up bay and then only permit vehicle entry when “balancing” conditions exist. 5)	Most importantly when the car park is about to reach an unsafe and unacceptable level of service (LoS) vehicles will need to park outside the “car park” and use other forms of access to enter the city centre. 6)	With current technology trends, the possibility will exist in the future where the vehicle entry fee to access parts of the city centre will need to be paid to gain entry before the vehicle even leaves its current location. Great analysis Alan. I always do enjoy it when I find that I agree wholeheartedly with one of your posts. I think a lot of the problem isn’t just the slow moving surface vehicles, but also the times between connecting services. During peak hour, every street and every platform in the CDB should have services operating every 3 or 4 minutes tops. Instead what should be a 20 minute journey frequently turns into a 30 minute journey because you’re waiting for your connection for 10 minutes. Of course this won’t be possible with the number of cars in the CBD, bringing me back to your point.